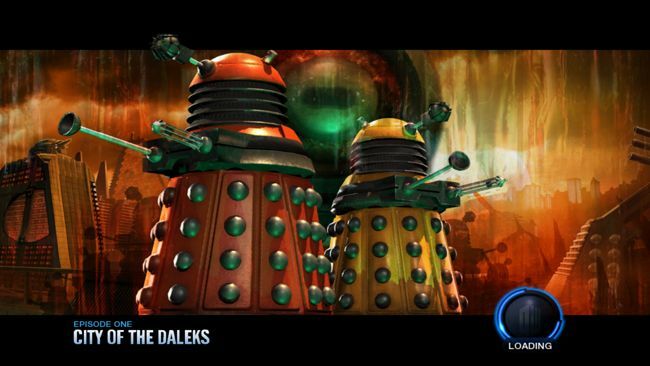 Doctor Who @ 50 Doctor Who has not done well as part of the videogame industry. There have been a fair number of professionally-made games based on the series, but few with the BBC’s official blessing and of them an even smaller number that were actually worth playing for any length of time. "Good" in this context doesn’t necessarily mean that the game sticks to established continuity. In fact, one of the better Doctor Who games, possibly the very best, played a little fast and loose with the character of the Doctor, but it made for a decent arcade experience. Join us, then, as we look back at game developers’ attempts to bring the Doctor’s adventures into the hands of computer buffs, from the 8-bit era right up to the present day. 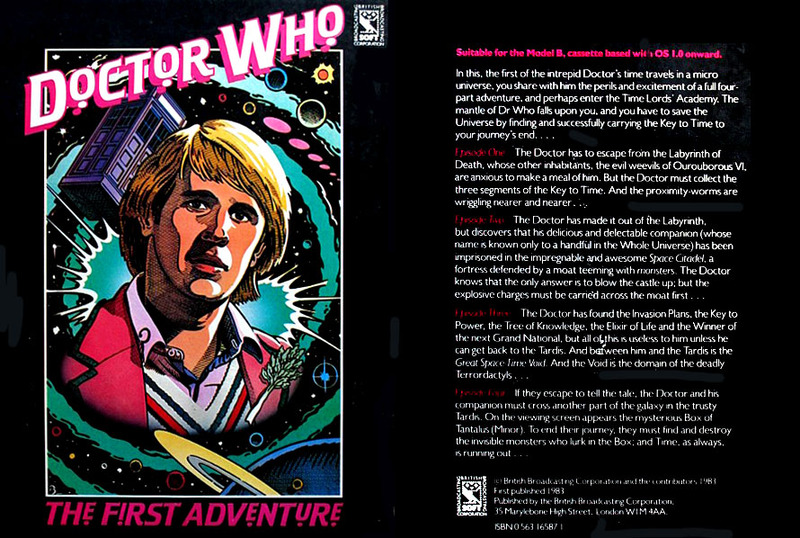 The first official Doctor Who game was, appropriately, called The First Adventure and equally aptly, it was released for the BBC Micro and published by the BBC itself. Written by one Jeremy Ruston, First Adventure was simply a compilation of four popular arcade games - Pac-Man, Frogger, Galaxian and Battleships - each given a Who-style graphical makeover and linked by a very basic storyline centring on the recovery of the Key to Time and its placement at the middle of the universe. As a player you got 15 lives - “regenerations” here - and you had 60 minutes to complete all four sub-games. Only the first involved finding the Key to Time - only three segments, not six, mind - with the other three about rescuing a companion and zapping monsters. Having found three Key segments, rescued your assistant, dealt with the Terrordactyls and recovered the Box of Tantalus from alien tea-leaves - presumably you need the Box to put the Key parts in; who can say? - you were done, and the process of taking the Key “to the centre of the universe, where it can be used to initiate the Second Age of Time” was left to your imagination. As were the graphics. The first game, "Labyrinth of Death", exchanges Pac-Man for the Doctor, but he’s represented as a plus symbol. Ghosts become snakes, which are horizontal or vertical lines. The maze looks more like a cavern, true, but it’s basically "grab the goodies before the baddies get you". Level two, "The Prison", was more obviously Frogger: guide your little stick Time Lord past rockets, riverine beasties, asteroids and flying saucers to reach the safe spaces at the top of the screen. Part three is called "Terrordactyls", which are birds that hover around at the top of the screen trying to crap on you from a great height, but occasionally swoop down for a better shot. You have to shoot ‘em all. The token Who reference is a Tardis graphic up on a ledge. Finally, ‘Box’ is Battleships played on a cross-shaped grid: enter co-ordinates to try and blast the hidden aliens. Quite apart from being poor, The First Adventure had a painting of Peter Davison on the box. But he quit playing the Doctor in 1984 - around the time the game went on sale - so his picture hindered demand when Colin Baker took over that same year. Meanwhile, unofficial Doctor Who games were starting to appear. Back then, before BBC trademarkers went eagerly and greedily to work, it was easy to include references to the Doctor, perhaps even to include an 8-bit image of a Police Box, and get away with it. Proper nouns were harder. Red Shift, a company based in London’s Stoke Newington, released Time Lords on the BBC Micro in 1983, a role-playing game designed by Julian Gollop (who had only just left school) and programmed by Andrew Greene. Instead of Daleks, Cybermen, Zarbi and Autons, the game featured Kaleds, Cyburmen, Zarby and Nestines. Humans too. Locations included many planets featured on the TV show but with subtle changes to avoid complaints from the BBC and the attention of m’learned friends. The game divided the universe into five separate locations - the omes of “the five great starfaring races” - each accessible in any of 15 time segments. The five races have been battling for millennia, but history has come to an end with no victor in sight, and so they’ve all “hired powerful Time Lords” to change the course of history and thus win the war. One to five players can take part, each assuming the role of a mercenary Time Lord. It was a turn-based strategy game with a little role-play - well, stats and scores - as each player attempts to lift their chosen race to the peak of civilisation. You also need to find four Key to Time segments and a companion, all hidden in space and time. You can lay Time Traps to snare other players, but you have to spend Time Points to use your temporal scanners and such. Arrive in the same place and time as another player, and you use a scissors-paper-rock-esque combat system to work out the winner. Last Lord standing wins the game, or whoever has the most points at the end.